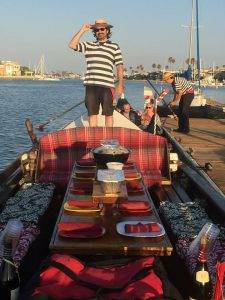 When I first started the Gondola Getaway, I was still in my youth of 25 years old. 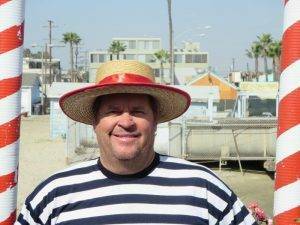 I was starting a business but was still surfing and traveling to Mexico as often as possible. We would head to Baja and camp at K38, K55 and our “regular” spot at Punta Banda a few kilometers out of Ensenada. A typical trip would bring us across the border, hit a joint in Rosarito for a few cases of Corona and Pacifico and head for Ensenada. We would roll into Hussongs Cantina and play a little taco roulette (I will explain the game at another time.) On our way to our “go to,” “to go” dinner joint of whole roasted chicken and fries, we would grab a few $12 dollar Mexican blankets and head out to Punta Banda to camp. We literally would drive the truck out into the sand dunes on the beach until we got stuck. We would make a fire, eat the chicken and roll up in our Mexican Blankets and hit the sack until a sunrise surf. We would lay out the blankets on the beach during the day, cut a hole in the middle,of the blanket for the evening to use, as a jacket/Serapes and then roll up in them for the night. When we got home they would become seat covers in our old cars. 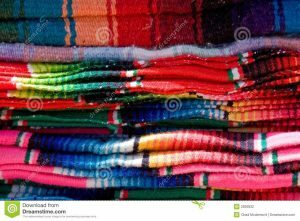 During that time we built up a supply of these oh so useful Blankets from South of the Border. 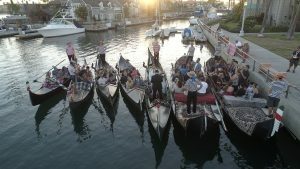 As the Gondola business grew and we had four boats in our fleet, We were asking our guests to dress warm for evening and winter cruises. We even would suggest they bring a blanket! We never had seen blankets on Gondolas in Italy, so it didn’t cross our minds to offer them to the guests. We wanted to be full service, so it was decided to purchase some blankets for the boats. Ah Ha! The only place I personally had ever purchased a blanket was, you got it, MEXICO. Well thats what inspired the Annual Mexico Blanket Run! 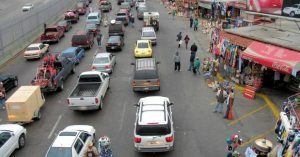 It was decided that we would buy new blankets for the growing fleet each year by doing a Mexico trip with the “main” purpose to buy Blankets for the Gondolas. Those trips gained quite a following where we would sometimes travel down to Ensenada with 20+ people, just to buy blankets, ha ha. The trips would sometimes go longer than the weekends and started to include hotel stays at La Fonda. Margaritas, Sunday Brunches, Ocean front rooms, etc. became the norm. I am sure at the end of the trip and the buying of “the blankets,” that our actual blanket cost was astronomical. We used to joke that it would be much cheaper to go to Nordstrom to buy our blankets. There was even the one year that we got so caught up in the trip that we forgot to buy blankets. We had to buy them in the border line where the negotiation is tempered by the fact that we were out of money and running around the stalls while the car was moving forward. Now we all know that bartering in Mexico is the proper way for buying and selling. In fact I learned over the years that if you were not willing to bargain, the seller got kinda of mad and frustrated It was cultural and it became a great negotiation. We would sometimes post up a Hussongs where right across the street was a Blanket Vendor. I would head on over and ask how much a blanket was? Back then it usually started at about 20 bucks so I would start with the old classic, “Well, how much if I buy 2?” That usually got it down to about $15 bucks a piece! “Hmmm, seems expensive!” That usually got it down to about $12 a piece. So I would say I had to think about it and head back to Hussongs for a beer. Upon return, I would head to another joint as if I was going to check prices and my original guy would yell out, “Amigo,” let me make you a better price!” So now we were at about 10 bucks a piece, I threw out the “How bout I buy 6 blankets?” Now he thought the beer was getting to me so he figured he had me on the hook so he said ” If you buy 10 I’ll give $9 a piece!” Now I knew I had “him” on the hook because he had no idea that I was actually there to buy 25 or so blankets. He had set the standard for the more you buy, the cheaper I’ll go! So I would say, “If I bring some friends over to buy more can we get a better deal? “Of course” bring them all! Ha, Ha, so I would go back into Hussongs Cantina and drag back over at least 10 people and end up with 25 blankets for about 6 bucks a piece. Of course the $6 bucks doesnt’ quite hold true now but the trip down still does and we have 35+ years of stories to go with the 100’s and 100’s of blankets we brought back. Each year could be a rousing chapter in the “Book of Blankets!” So even if I found a cheaper way to get “em, I wouldn’t because the stories are much better than the savings. Over the years I have had employees be captured by the Gondola bug and ventured out and started their own Gondola business. 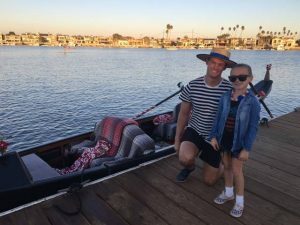 Others have been inspired by our History and opened up Gondola businesses across the Country from San Diego to Rhode Island and even in Minnesota! 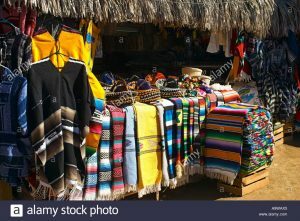 If you look a bit into each business, you might find they all have the Mexican Blankets now! I kid you not, I brought a couple of blankets over to Venezia and gave them to a Gondolier friend. He still uses them. Imagine if those guys make an annual run to Mexico for blankets! They would probably just go to Spain, ha ha. 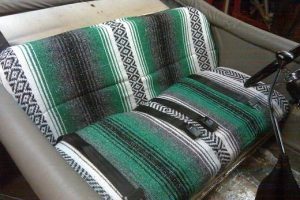 Now that you know the story of the Mexican blanket, I want to share with you the new “Gondola Blanket.” The same blanket with a 37 year story of their immigration to the seats of Gondolas in America and Venezia, Italia has created a deservedly new name. Gondola Getaway presents to you, The Gondola Blanket! I have decided to share these incredible cozy, long lasting blankets with you. They will be for sale soon at the Gondola Getaway! On line or for pick up! They will all come across the border just for you. Story included. I will be driving down a bigger Van from now on!